Get 10% off ALL Brick Loot Subscriptions with code batman10 at checkout. Save $6.50 Recurring 6 months’ plan subscription just $24.95 per month. No code needed! Save $6 on Recurring 3 months’ plan subscription just $25 per month. Recurring 1 month plan subscription only just $27.00 Month + Shipping. 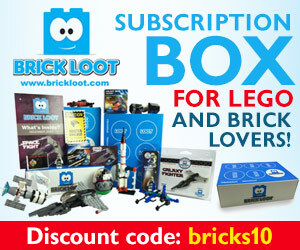 Brick Loot is a LEGO subscription box invented by a then 9 yr old boy from Chicago! BrickLoot.com offers custom LEGO kits, LEGO Minifigures, Light Kits, Accessories, Exclusive Brick Loot sets and more! Subscribers will receive a monthly box filled with unique, custom and never-before-seen items that work with LEGO bricks and custom building. Each month your Brick Loot box is filled with 4-8 items which were hand picked by Brick specialists who scour the world for the newest and coolest products for you to collect. Shipping charges on all subscription boxes is $6 in the USA and $13 in Canada. Found a coupon for Brick Loot?